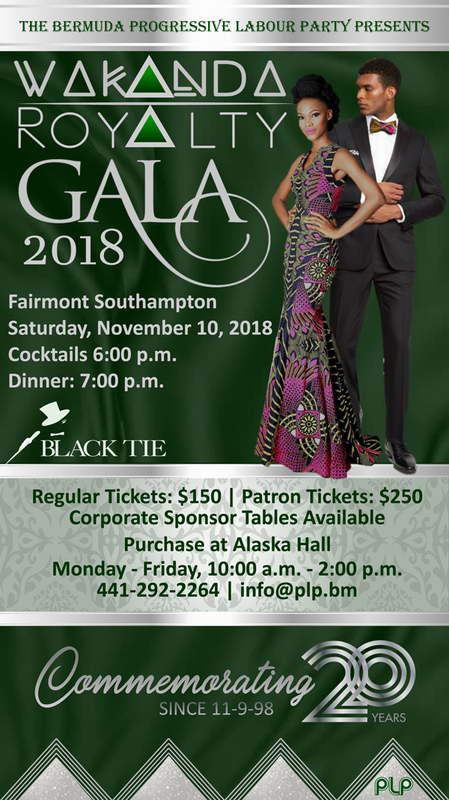 The Progressive Labour Party [PLP] will be holding their 2018 Gala Weekend from Friday, November 9 to Monday, November 12. A PLP spokesperson said, “The Progressive Labour Party will be holding our 2018 Gala Weekend from November 9-12, and invite our members, supporters and friends to join us in celebration. “Founded in 1963, we are Bermuda’s first and oldest political party. This year we plan to celebrate our accomplishments, keeping in mind that there is constant work to be done on behalf of our constituents and the people of Bermuda. “The weekend will begin on Friday, November 9, when the Speech from the Throne will be delivered, setting in motion the Government’s legislative agenda for the upcoming session. This date also marks the 20th anniversary of our Date with Destiny, when the PLP Government assumed the seat of Government for the first time, in 1998. “On Saturday, November 10, starting at 7:30am, there will be a PLP “Captain’s Choice Golf Tournament” at Belmont Hills Golf Club. Prospective participants can register by contacting PLP Headquarters. “This evening promises to be one not to be missed. The Gala gets underway at 6pm for cocktails and dinner at 7pm. “On Sunday, November 11, Remembrance Day, our celebrations will pause to reflect and remember those that lost their lives in war. Our Leader, the Hon. E. David Burt, our Cabinet, and other MPs will participate in the Remembrance Day Parade and laying of wreaths at the Cenotaph. “Monday, November 12, will be dedicated to Community Service, and members of the party will be called to assist in community service. PLP don’t even bother to pretend anymore about being an inclusive organization. About time they were true to themselves and make it known they have ways wheen and always will be for only one demographic of this diverse island. Grocery prices going up people struggling but a $150 gala… Ok. These are rubbing our faces in it! Holding a celebration when our seniors can’t afford to eat or buy prescription drugs as OTC drugs are not covered by insurance! You should be ashamed of yourselves! Not much Labour anymore, but plenty of Party. Shame grass root Bermudians are priced out, let alone the unemployed, but they’re only needed at election time. What no Church Service on Sunday at Tweeds? Shame on you Burtie!! PLP Royalty – Sounds more British than the British!